Ever been to a junk yard and saw the car you wanted to pick apart has already been stripped clean? And then you wondered, "maybe if I knew it was there a day earlier I would have gotten to it." Well then the Classic Junk app is for you. 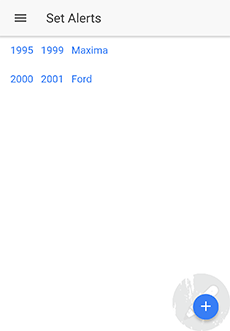 This app will search for you, just enter in the type of car you are looking for, like Camaro or Celica, then a date range and done! 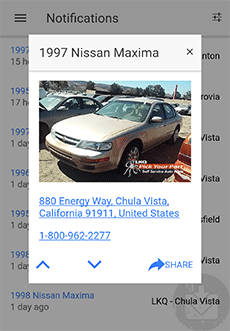 Once a car you are looking for pops up it'll send you an alert with the location of the yard that it is in. Just a simple straight forward app, no BS, just the info you're looking for. Don't let another car pass you buy that you need for your project. Add the cars you want to find. 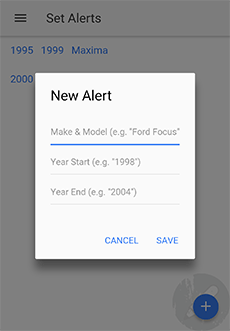 View & Edit your alerts.